tests immediately available on tablet. Data also includes trends. Can track fatigue, breathing, swelling. Can automatically send data to doctor — almost real-time report on changes in conditions! sell “Necklace” for $300 — patient wears 10-15 min a day, send wirelessly to cloud. $100 billion potential savings in medical costs: more evidence for GlowCap! 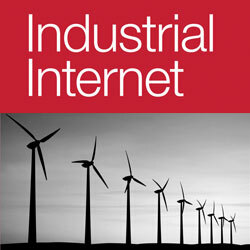 In the draft of the article on the Internet of Things that Cisco’s Dave Evans and I hope to sell to the Harvard Business Review, the lede (BTW, I love old newsie terms, like “pieing the type”…) is about reducing the waste in medical spending by improving patients’ compliance rate with drug compliance through use of the Vitality GlowCap, my favorite poster child for the IoT. 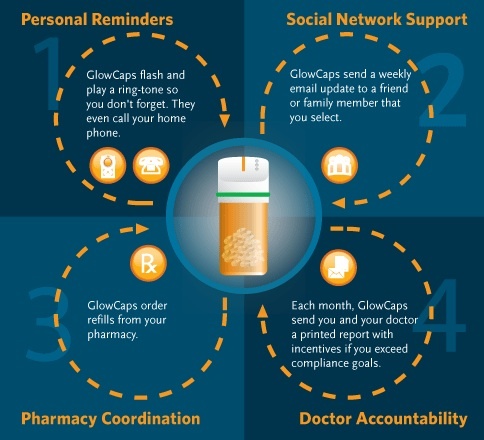 If you aren’t familiar with the GlowCap, it fits on a regular pill bottle, but has an important difference: each one has its own IP address, and includes a sensor, transmitter and battery.It’s preset for the time when you and your doctor agree you should take the pill. When it’s time to take your pill, the cap begins to glow and makes a gentle sound. As soon as you take the cap off and replace it, a signal is sent to the company’s server where it is recorded: you and your doctor both get reports of your rate of compliance (for the first time, the doctor actually knows if you’ve taken your pill: no guesswork!). But if you don’t take it, the sound and light become more insistant, and continue for two hours. Then, if you still haven’t taken it, you and/or a caregiver or relative get an email, text or recorded alert. How cool is that? By pressing on the bottom of the cap you can even place an automated request to your pharmacy to refill the prescription! Bottom line? 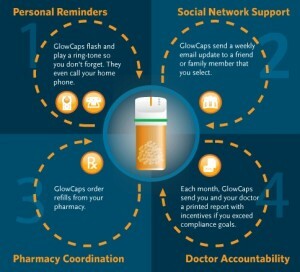 With the GlowCap, studies show that patient compliance increases from an average of 50% to 85%. According to these new numbers from the IMS Institute for Healthcare, that’s HUGE: they estimate that failure to take pills on time results in $100 billion in wasted health care spending annually! 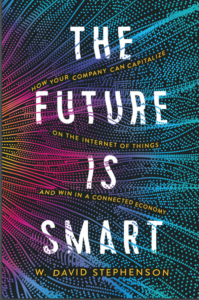 I’m still dubious about the nirvana of IoT refrigerators that will prepare my shopping list for me (I’m more the kind of chef who, about 2 hours before dinner, starts to wander the online recipe sources for something I’ve never made before: until my refrigerator becomes psychic, I’m not holding my breath…), but the GlowCap is just the kind of IoT device that can truly make our lives a little simpler, and save money — and lives — in the process! P.S. : I’ve tried it myself. It really works.